Today guys we’re gonna be talking about something massive, we’re gonna be talking about something awesome. The reason why I want to talk about this with you, is because for the last few months I hasn’t been doing much, with different business that I’ve been doing I’ve been kind of building a different business model, kind of peeking into how can I build thing differently and the type of results that I’ve been getting, I said to myself, I had to come and share some of the amazing ways or new ways of really building a business online to make it happen. 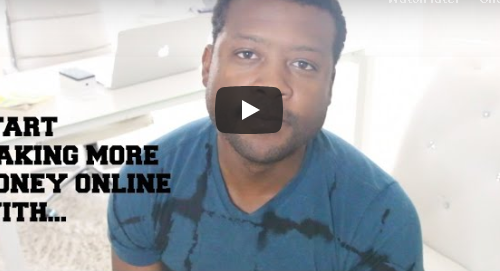 I’ve been building my business online for the last seven years, now I’ve never built a business like the one that I’m gonna show you. I’ve never seen profits so fast or long-term something that can sustainably make money. What started to happen with me when I started my online business, I got introduced to different companies, different products, and a lot of the time companies would fail, then I find myself you know I’m having to start over or I start doing drop shipping and I’ll send out a bunch of items and because of something that would happen with the provider with the person that’s actually sending out the items they would get late, customer would be mad then something would happen and it would be totally crazy, but today I want to show you something different. 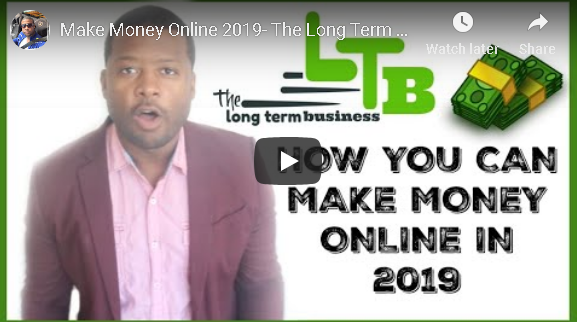 I want to share with you something that I’ve been working with my wife, what I’m calling this, is the “Long-term Business” and what we’ve been doing guys is to build a brand long-term. Now what I mean by brand, what I started to pay attention to? I started to pay attention with my kids, I got twin daughters and I got one little girl so I got three girls, one other thing that started to catch my attention was every time they wake up in the morning they would come and say hey good morning daddy and they’ll take my phone, whenever they take my phone they would go downstairs and start, you know watching YouTube, different stuff on YouTube, now stop paying attention to them, what I started seeing was the fact that I didn’t tell them who to watch, but they knew who to watch. They know who to watch, they know who the brand is that they actually want to watch, they would tell me hey this is what’s happy and this is who we subscribed to, they would just take the following go to whatever they want. So what I started realizing was the fact that because they have their own brand, they know who they follow, is things has been changing back in the days, with the media will tell you hey this is whose hot you know Hannah Montana and etc., but now they’re the one telling me what’s hot, not the media not TV. They get the choice the power of choice, and what I started to realize is that people that has a brand and it doesn’t matter if it’s in parenting, if it’s for kids if it’s for wedding, if it’s for beach, if it’s for vacation, people that has a brand now, people started to follow this brand and develop trust in this brand and watch them and pay money and buy the stuff over and over again, so it started making sense to me how people spend their money with someone they know, with a brand they know versus someone they just don’t know that’s when we started looking into. Another for you to make money online you need traffic which we’re gonna cover tonight, you need traffic that leads to an offer and from the offer when people buy, you make money. 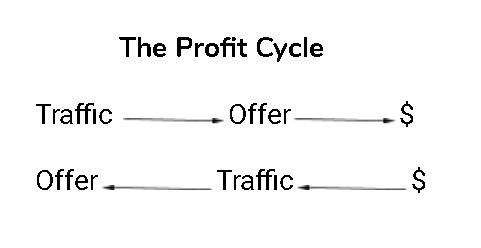 This is the simplicity of making money online, if you can get that, you actually can make money online, traffic, offer and then money, that’s it. 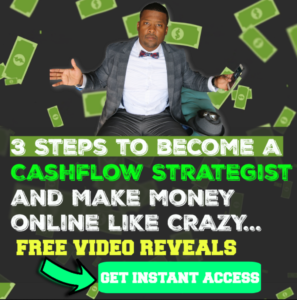 So most webinars you would get on, they would tell you the good life, the story from, “hey I was broke and everything, I have the system that’s making me money right now”, and they’ll make you an offer, so people would end up here, so most people at the end of the webinar they have an offer, and it works backward because you have an offer and now you have to figure out traffic cuz you like, “okay well I just paid $5,000 for this thing on this webinar or $2,000 for this thing okay now how do I make money with it?” So now you left figuring out traffic, what would I do, which now traffic is what makes you money, so now everything is backward because now you left with an offer you need to get traffic in order for you to make money. 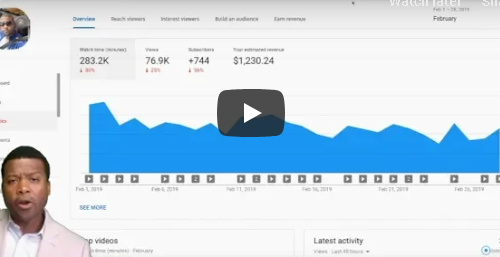 Well this is gonna be different cuz I’m gonna start with traffic, I’m gonna start with showing you how to get traffic, how to build traffic, how to build a business by building traffic, and then I’m gonna show you what you can actually sell with this traffic. Now my wife has a youtube channel, she got into this whole wedding niche, she started doing DIY, this is a niche ok a wedding niche or DIY niche, people do that stuff, so she made a video, and the video ended up going viral started getting views in traffic but I said to myself I wanted to see how can this thing go to a whole next level she got a video that went viral that got 400,000 views, so when we saw that in that niche we said, “hey there’s a niche here, where people were willing to watch, and things give their feedback, that’s a niche”, so she made one video about it and see what happened she did another video about this stuff she had 297,000 views that’s when I took notice. I’’m gonna show you how to build, I’m gonna show you not only how to get traffic and I’m gonna show you how to monetize the traffic and make money, and this is not something that I can only do with my wife this is something that I can do with any of you in here, because I’ve started to master this in the last 6 months and I created a formula around it where we all can build brands, that makes a lot of money online every single day, without having to beg people to join stuff without having to really cash out on multiple different ways, because what happened when you’re selling just one product whether it’s affiliate marketing, you don’t sell somebody else product or whether you’re selling your own product, what happened is that when you have one way of making money which is just one stream of income, if you’re not making any sell you get stuck, you don’t make money for the day or for the week or for the month, but what I started to realize when you have a brand that has multiple ways of making sells you can tackle it in so many different ways where you have to make a lot of money, you just have to do it, if one doesn’t work the other one is gonna work. Passion – that’s one of the ways this is gonna work, this is not gonna be something like you’re not passionate about. If you’re not passionate about it, it’s gonna be almost impossible for you to make it happen, because it’s gonna dread you every single day. If you have to get in a niche that you don’t have any passion for. Sometimes I see people get into something for the money and it’s it kind of kills them, because of the fact that if they don’t get the money right away they quit. Interest – if you don’t have a passion into a niche it could be an interest, something that you at least have some interest, like maybe I want to learn, I want to learn about parenting, I want to learn about interior designing, I want to learn about that stuff, maybe you don’t have the passion but you want to learn. Something that you have some type of interest and that’ll keep you going. Skillset – even if at your job, like let’s say you’re a baker you create big cakes, I can show you how to leverage those passion and those skill which is the 3rd thing we’re gonna be talking about, which is having a skillset. If you have a skill into anything I can show you with this business model a skill, something that you love to do, it’s not something you’re gonna stop doing tomorrow, like it’s a lifelong journey for you, like if you’re a cook and you love to cook food you’re gonna be cooking food for us of your life you enjoy them, matter of fact you love it that’s what you love doing, if you love editing video that’s your passion. That’s the skillset that you have, so this is not gonna go anywhere, what if you can monetize those things, that’s not going anywhere? Those things you’re gonna do for the rest of your life, that’s started to click, what if you can build a brain around that. Asset – The next thing is gonna be for this to work, you wanna create an asset. Let’s say you don’t have all the three things that I’ve talked about up there, you don’t have any passion for it, you have no interest, you have no skillset, but you just want to create an asset, well I’m gonna show you how to create an asset because once you have traffic you have what’s called an asset. The asset can make you money over and over again, I learned that from Robert Kiyosaki, the big difference between liability and asset, a lot of people thought the house is where assets but we know from reading Think and Grow Rich and Rich Dad Poor Dad, that a house if it’s not making you money every month, if you don’t have people renting it, it’s not an asset it’s a liability. Once I learned these things, it’s like I start looking on ways to create assets online. 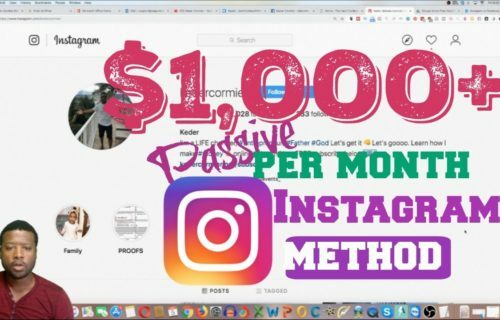 Well, this can be a way for you to create an asset that keeps generating cash flow for you every single day, every single month, every single year and year after, why? because your skills and your passion throughout the years, they’re more likely gonna be the same, so if you keep learning and growing that passion, is now gonna change, your passion doesn’t just change overnight. Straight up for the money – The fifth thing which is straight up for the money, that’s not what I would recommend but some people they just do stuff straight up for the money, like I’m not gonna be ashamed of it, when I started my online business, I didn’t do it for me to motivate people, for me to learn how to build, no, I was trying to pay bills like I did it straight up for the money like I was drowning in bills my wife lost her job, it’s true you know, I started my business because I wanted a way out, I didn’t want to wake up and go to a place that I didn’t like. I wanted to have the freedom to travel, I wanted to wake up and do whatever I want, I didn’t want money to be a factor, I wanted to make six and seven figures and beyond, I want to grow, I didn’t want someone else to tell me how much I’m worth, I wanted to keep growing and growing so that I’ll feel good and I feel established and I feel great and I can help as many people. Someone says that the best way to help the poor is not by being one of them, so I wanted to adapt that model and create cash flow for my family to enable them to get the stuff they want so I straight up started for the money. Let’s go take care of the traffic, because I told you on most webinar you go, they take care of this which is giving you offer at the end of the webinar for you to pay money and then you get stuck, you don’t know how to get traffic and therefore you can never get to this, you can’t make money, well I’m gonna start out with traffic and then I’m gonna show you how to get offers and I’m gonna show you how to get to the money. So let’s get into the traffic, we created in the last couple of months, with this brand we created this group, a Facebook group is so so powerful so we created this group that has over 17,000 people. Look at the growth pattern, it just keep growing it just keep going up and guess what guys I didn’t spend much money at all, all I’m spending is five bucks a day, most of the traffic is coming from other people bringing people to me, it’s like you telling your friend, “hey you need to check this stuff out”. You can see all these people that’s coming in, a lot of them are being referred by their friends. This is called referral based marketing traffic, so this is referring me someone who actually seen something, they refer me and they say, “hey this is the most amazing thing, you gotta check it out like you gotta buy this stuff”, that’s why word of mouth is still the most powerful way of marketing till now because the trust factor is already established, I don’t have to convince them all, they already on board because they’ve seen the results so, therefore, I’m more likely gonna trust this person then I am to trust this person for different reason. So now on Facebook and take one of our niches and we’re gonna do some research, this is how you get started, let’s say you was gonna go into graphic designing because we’re not trying to reinvent the wheel guys we’re trying to just find what’s already working, so graphic designers, look for a Facebook groups, so look where the traffic is, when it comes to niche don’t get into your feelings, do your research because the money is in the research, because you would be thinking like nobody is into that niche, this is just because you don’t have interest into it doesn’t mean that it doesn’t have a use niche into it. This can be done in so many different niches, we put up the niches we talked about photography, you can do your homework and find something that you have interesting something you have interests in will make it a lot funner, because this is what you love your passion anyway, it’s not like, if you want to do it straight for the money and also you don’t have no passion, go for it, but I’m saying if you have a passion just mix it a lot more interesting you know and if you have the skills in it it just makes it a lot more interesting. For more information, be sure to watch the video above, so you’ll get more shining on the Idea.